What is the difference between cold, influenza, and ARVD? Cold is the body condition when phylactic power is weakened, susceptibility to viruses and bacteria is increased; body’s own bacteria living on mucosa become activated and cause inflammation. If one got caught in the rain, was not dressed for the weather or just was sitting close to an opened window in the cold season, he/she is at higher risk of getting sick. With respect to ARVD, this condition can be passed from an ill person to another one. Catching parainfluenza, rhinovirus, adenovirus or any other ARVD (acute respiratory viral disease) type, whose number exceeds 200, can be relatively easy. Influenza, which is the respiratory virus that is characterised by remarkable fever, more severe disease course and high risk of complications, is transferred in the same way. Once first symptoms occur, a type of the disease attacking a body becomes easily understandable: this is one of common respiratory viruses or influenza, after all. Let us consider symptoms of those diseases more closely. Sudden rise of body temperature at the very beginning of the disease (38-39° C and above). It might be difficult to lower the body temperature elevation caused by influenza virus. Chills, asthenia, body pain, headache. Dry cough, which is occasionally accompanied by chest pain. During the first days of illness, catarrhal signs (runny nose, sore throat) are almost unapparent. At the beginning of the disease: stuffy nose, runny nose, red and sore throat. Cough and chest wheeze may appear at day 2-3. Elevated body temperature is a characteristic sign of ARVD, which appears against catarrhal background. In young infants, ARVD may be accompanied by loss of appetite, irritability, and sleep disorders. The infant cries a lot, and his/her tone of voice appears to be changed. 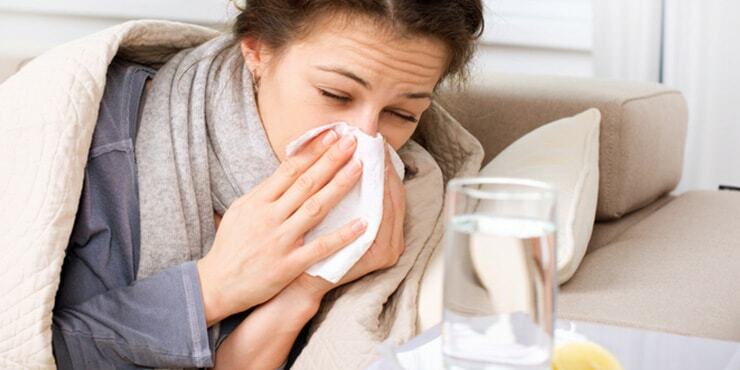 Respiratory viral infections are commonly pooled by the “cold” term. Depending on a virus type and its location, pharyngitis, laryngitis, bronchitis, laryngotracheitis and other diseases caused by a respiratory infection may be diagnosed. However, “influenza” diagnosis can only be established after special laboratory testing. The question as to the remedies against cold cannot be answered unequivocally. The treatment schedule will depend on source virus characteristics, patient’s condition, reported symptoms and their severity. Eventually, the respiratory disease may develop against the background including fewer, gastrointestinal disorders; significant deterioration in general patient’s condition. In such cases, hospitalization is recommended, in particular, when a patient appears to be a young infant. If the disease course is not complicated, a physician would recommend symptomatic medicines for cold, e.g., antipyretic, antiseptic, anti-histamine agents, etc. Eventually, use of the immunomodulating agent, which proactively increases body’s resistance against infections, may be recommended. An illness is never well-timed. Thus, the question “how to treat cold rapidly?” does not lose its relevance. And not only rapidly, but also efficiently. This can be done, if you have a nebulizer. The main advantage of the inhaler used for respiratory diseases management is its ability to deliver medicines directly to a lesion. 1-2 Decasan® nebulas: twice daily. The АКК® antiviral medicine is to be inhaled up to eight times daily. The Lorde® Hyal cough medication should be inhaled twice daily. Your physician can recommend you other symptomatic nebulizer treatment. Medicines for nebulizer therapy are marketed as special nebulas containing sterile solution, and generally, designed for single use. One nebula is intended for one inhalation. Use of non-sterile (multi-dose) solutions packed in vials may lead to treatment complications.